Super easy Santa Christmas card -- with video! I hope everyone is safe and sound following Sandy's grand waltz through the eastern part of the country. So far there has been little damage in my immediate neighborhood. Since the power remained on during the storm I was able to post my latest stamping project to YouTube. It's an adorable Christmas card with a Santa suit motif that's very easy to make. During Stampin Up's week-long celebration of Digital Scrapbooking Day, beginning October 29th thru November 5th, you can get FREE downloads and 50 percent off digital kits! Check out my online store for details. Need a catalog? Let me know and I'd be happy to send one your way. Please give me a call ( 410-647-4011 ), drop me an email (terhare@hotmail.com), or text 410-804-6745 . My Motto is "Stamping is fun!" 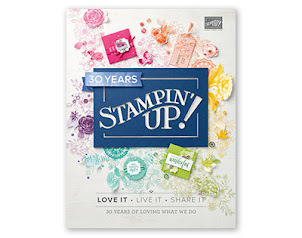 Stampin Up has announced a 24-hour sale beginning Monday, October 29th. All stamps (with a few exceptions described below) will be 15% off! Stampin Up is calling this the Sell-A-Stamp Spooktacular, and the goal is to sell more stamps in a single day than ever before. The sale starts at 2 AM eastern (12:00 AM (MT)) and ends on Tuesday at 1:50 AM EST (11:50 PM (MT)); during the sale period almost every stamp will be 15 percent off. Cookie press stamps -- these make great gifts! Any order type qualifies for this promotion---customer, workshop, or online. Other big news for Monday, October 29 that you will not want to miss! During Stampin Up's weeklong celebration of Digital Scrapbooking Day, beginning October 29th thru November 5th, you can get FREE downloads and 50 percent off digital kits! Check out MyDigitalStudio.net for details. Questions? Please give me a call (410-647-4011), drop me an email (terhare@hotmail.com), or text 410-804-6745. Need a catalog? Let me know and I'd be happy to send one your way. I made a short video How-To video for a 3"x3" note card using Stampin Up's Scentsational Seasons stamp set. There is a coordinating framelits die cut for this set--which I don't have yet---but I was still able to make cut-outs for my card. My card was inspired by cards DeAnn Rauzi made. This little card is the perfect accent for a hostess gift, teacher gift, cookie swap, or other holiday exchanges. I love the simplicity and colors of this little card, so much so that I included one in each of my club member orders. I'd love to see your 3"x3" cards! FREE festive Paper-Piercing Pack with purchase; click here for details. For a limited time, you can purchase individual clear stamps from select stamp sets (Word Play, Perfectly Penned, and Seasonal Sayings); prices are between $4.95 and 6.95). Contact me for specific pricing and ordering information. MDS print prices have been permanently slashed; click here for pricing.